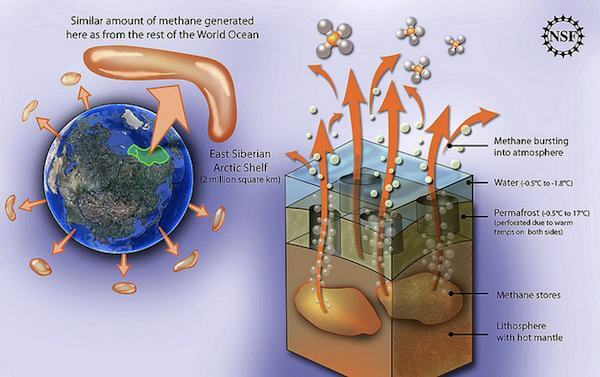 Dramatic levels of methane have been seen floating around the surface of the Arctic ocean, as a group of scientists have been investigating the increasingly large areas of ice-free waters around Russia’s Siberian coast. As a greenhouse gas, methane is 20 times more potent than carbon dioxide, so scientists are trying to determine whether or not this has been going on for a long time, or whether these are new outbursts of methane. These findings originally set off alarm bells. However, according to a paper published in the Journal of Geophysical Research, these emissions are from a thawing process that has been going on for about 8,000 years. According to the research, about 1 meter of subsurface permafrost thawed in the past 25 years, adding to the already thawed 25 meters. Future forecasts predict that even under the most extreme scenarios, thawed soil growth will not even reach 50 meters by the next millenium. This is a little reassuring. One of the researchers, Ed Dlugokencky, sent the New York Times a detailed review, summarizing that there is no evidence suggesting substantial increases in methane emissions over the last 20 years.